Not every muggle will understand. 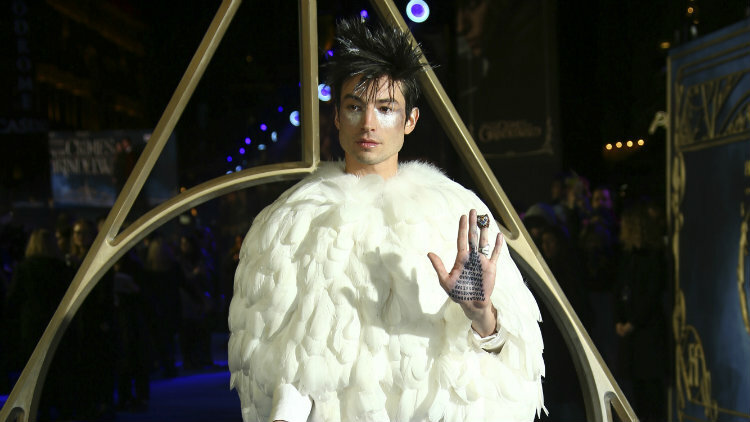 Actor and budding queer icon Ezra Miller is feeling every ounce of fantasy the Wizarding World of the Harry Potter universe has to offer. After gliding across the red carpet of the Paris premiere of his upcoming film, Fantastic Beasts: The Crimes of Grindelwald, in a puffy, all black Moncler x Pierpaolo Piccioli dress and cape, embodying the chicest dementor you’ve ever seen, Miller showed up to the London premiere of the film letting everyone know his style statement wasn’t a one off. This time around Miller embraced the other side of the light and dark, yin and yang duality, donning a white pants suit with a feathery shawl and tipping his spiked hair with silver. Of course Miller, who recently flaunted his fluid style within the pages of GQ Style, knows it’s all in the details. The actor also inked “Avada Kedavra,” the Wizarding World’s killing curse, onto each of his hands in a triangle shape, posing appropriately to showcase his look’s finer points. Consider us be bewitched and bemused.